If I'm going to make a comforting pasta dish, I'm really going to go for it and forget about low carb, low fat, etc. 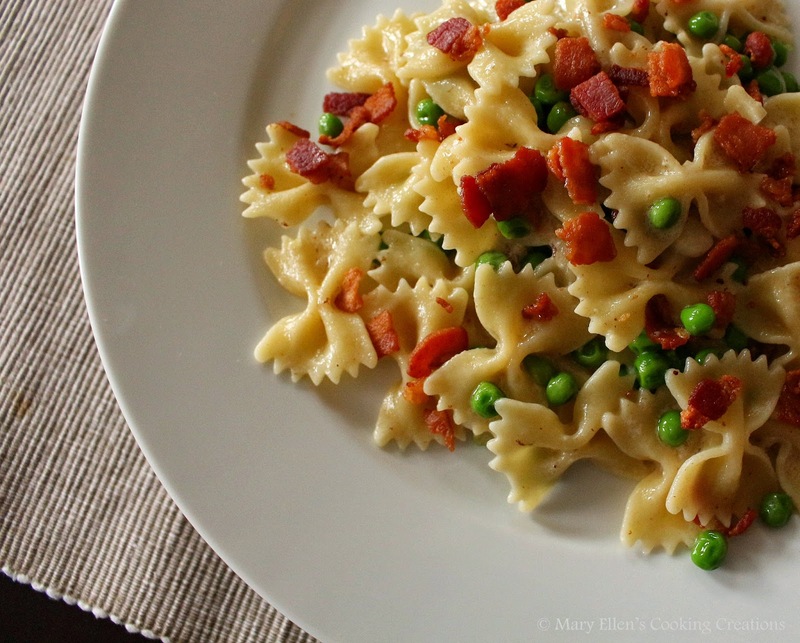 It has to be creamy, rich and hearty, cheesy, and the addition of bacon never hurts. Whenever my friend Jen comes to visit I always make a creamy pasta dish one of the nights, and since it was still freezing cold when she was here the last time, I was excited to make a comforting dish. I was inspired by this recipe for Pasta with Mascarpone, Garlic, Spinach and Crumbled Bacon from the blog Week of Menus. I changed up a few ingredients and some of the steps and was so happy with the final dish - it was exactly what I wanted it to be. Note - the mascarpone doesn't have much flavor, so if you are going to use it as a base for your sauce, I suggest using a second cheese and also some stock instead of the reserved pasta water. Cook pasta until done to your liking; drain and set aside. In the meantime, heat a large skillet over high heat. Add the bacon and cook until crispy. Using a slotted spoon, transfer to a plate lined with paper towels. Discard all but 2 Tbsp of the bacon grease. Lower the heat the medium and add the olive oil. Add the garlic; sauté 1 minute. Top with the crumbled bacon and serve immediately.